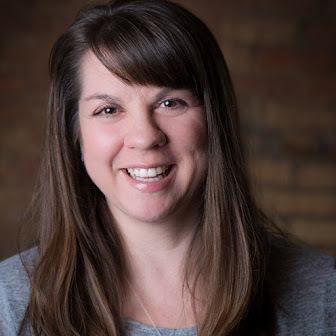 I participated in an Ambassador Program on behalf of Influence Central for P.A.N. Cornmeal. I received product samples as well as a promotional item to thank me for my participation. 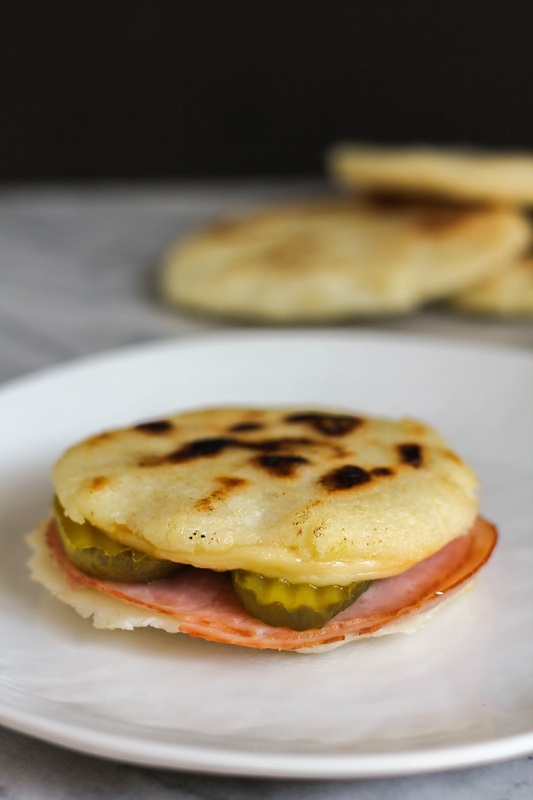 Kick your sandwich game up a notch with these simple and delicious Cuban Arepa Sandwiches! I've really been enjoying cooking with corn meal lately. 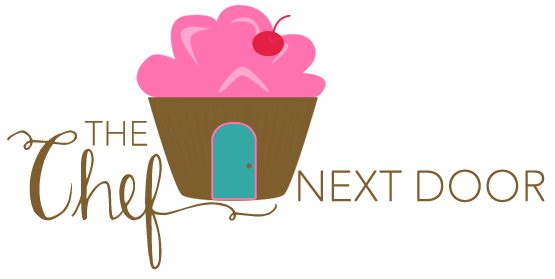 Whether it's cornbread or muffins, or even waffles, I've been using it a lot and experimenting in the kitchen. Corn meal is rich in nutrients and really a very versatile ingredient, and I totally understand now why it's a staple in so many countries all over the world. With all of my exploring into corn meal, I decided to try my hand at making homemade arepas recently. An arepa is a flatbread made of pre-cooked corn meal, which is fried, then split and filled with sandwich ingredients. The arepas themselves are actually very easy to make. The dough comes together very quickly, and is then divided, shaped and fried in a skillet. 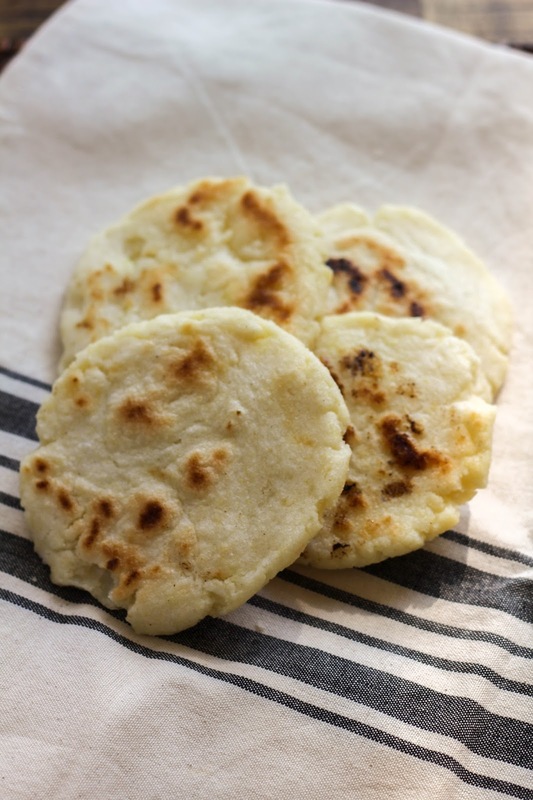 You can have fresh arepas on your table in less than 20 minutes! The traditional ingredients to fill arepas with are cheese and avocado, but I decided to put a twist on a cuban sandwich by using the arepa bread. 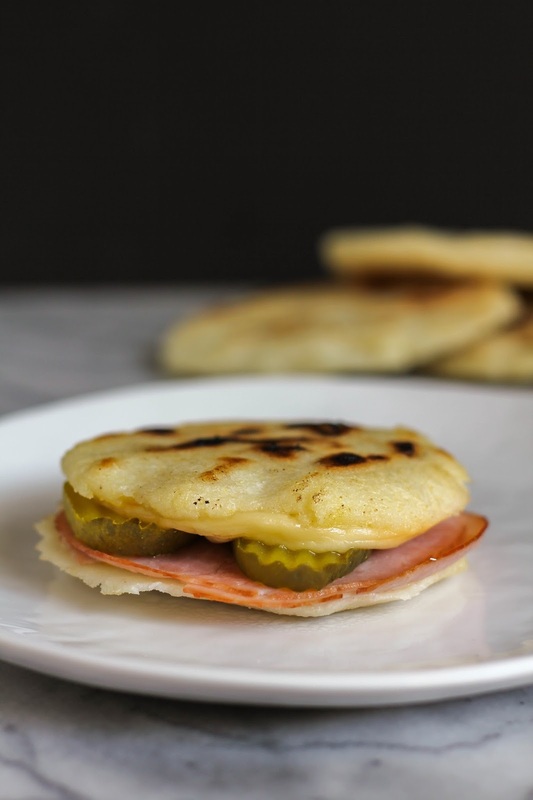 Filled with thin slices of ham, provolone cheese, pickles and a bit of mustard, then baked in the oven for a few minutes until nice and melty, these arepas are a delicious lunch or dinner that the whole family will love. This recipe makes eight arepas, but I'm including ingredients for just four sandwiches. If you want to make all eight, go ahead and double the sandwich ingredients. Now, who's ready to make some arepas? Combine the corn meal and salt in a large bowl. Make a well in the center and add the warm water. Using a wooden spoon, slowly stir until no dry lumps remain. Let the dough rest for about 5 minutes. Knead the dough a few times on a work surface, then divide it into 8 pieces. Roll each piece into a ball, then gently flatten each to about a half inch thick. Heat one tablespoon of oil in a large nonstick skillet over medium heat. Add 4 arepas, cover, and cook until golden brown, about 6–8 minutes. Uncover, flip the arepas, and cook until other side is golden brown, about another 6–8 minutes (keep the pan uncovered). Transfer the arepas to a wire rack. Repeat with the remaining one tablespoon of oil and dough. Preheat the oven to 350 degrees. Split the arepas in half and place on a baking sheet. Spread some mustard on the inside of each one, then layer three slices of ham, a slice of provolone, and a few pickle slices on one half of each sandwich. Put the baking sheet in the oven and cook the arepas for 10 minutes, until everything is heated through and the cheese is melted. Put the tops on the sandwiches and serve immediately.